Callard & Bowser's Dessert Nougat ... I miss thee! On this Sunday afternoon, I'm having a childhood flashback. 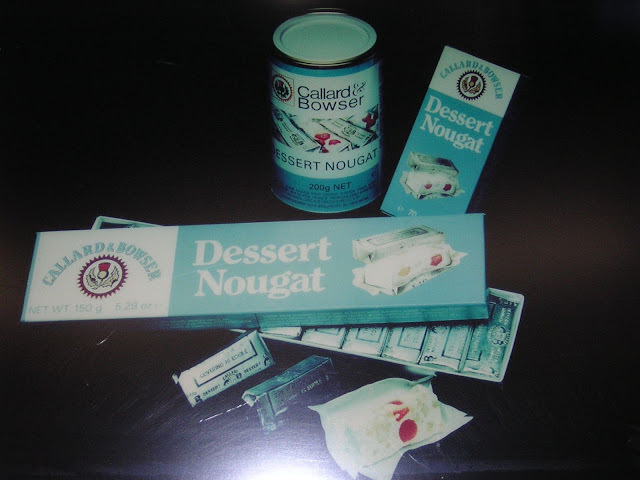 I am craving Callard & Bowser's Dessert Nougat ... the rice paper, nuts and cherries. My grandpa would buy these for me. They are no longer made. Sad. Please everyone who remembers this amazing product, write to Wrigley's and request that they continue manufacturing! I did today! I remember this too. Would love to get it again. No one makes this king of nougat. It was amazing. NOTHING has beaten this nougat!!! Fantastic nougat. Would love to be able to buy it again as nothing I've tried comes close!! I LOVE it so so so much!!!! My dad usually got those for me in my childhood. I couldn't forget it till now....I have been searching for them for many years.... PLEASE bring it back!!!! !